While the definition of energy efficiency — the goal to reduce the amount of power required to provide goods and services — has remained the same since it became a catchphrase in the 1970’s, methods of how to achieve it have unmistakably evolved. Once thought to be a short-term reaction to the OPEC Oil Embargo, the conservation movement has proven its staying power over the last four decades. The quest to become energy efficient has now permeated every major industry around the world, and certainly nearly all aspects of the building and construction trades. Roofing is no exception, and has arguably become the most important decision a building owner or facility manager can make when it comes to maximizing energy use. In today’s terms, much of that has to do with how we assess heating versus cooling days, which are still measured by British Thermal Units (BTUs). A BTU is a measurement for heat or energy source that identifies the amount required to raise the temperature of a pound of water by 1-degree Fahrenheit. When defining heating and cooling degree days, researchers base the measurements on the assumption that an outdoor temperature of 65-degrees Fahrenheit does not require heating or cooling for the people inside a structure to feel comfortable. The degree days are then calculated as the difference between the mean of the daily temperature and 65-degrees Fahrenheit. Anything above that temperature results in a cooling degree day, and anything below is characterized as a heating degree day. Just as limiting the amount of fuel and energy used to heat and cool a building was critical when the conservation movement began, today’s building owners and construction and design experts are focused on reducing a facility’s carbon footprint. That’s the buzz term given to the measurement of greenhouse gases, such as carbon dioxide, emitted by the use of energy powered by fossil fuels. The more energy needed to either heat or cool a building, the worse the carbon footprint. The reverse holds true for the less amount of energy needed to keep a facility comfortable on any given day. It generally takes more fuel to heat a structure properly than to cool it. The temperature differential needed to get occupants comfortable in colder climates is usually much larger than that needed to keep cool on warmer days. When it comes to roofing, contractors and their clients have options to become more energy efficient. In colder climates, where there will generally be more heating degree days than cooling degree days, having a rooftop that can absorb and retain heat may be a preferred solution. Insulation also plays a role here, and contractors should follow the recommended R-value for their particular region in the International Energy Conservation Code (IECC). 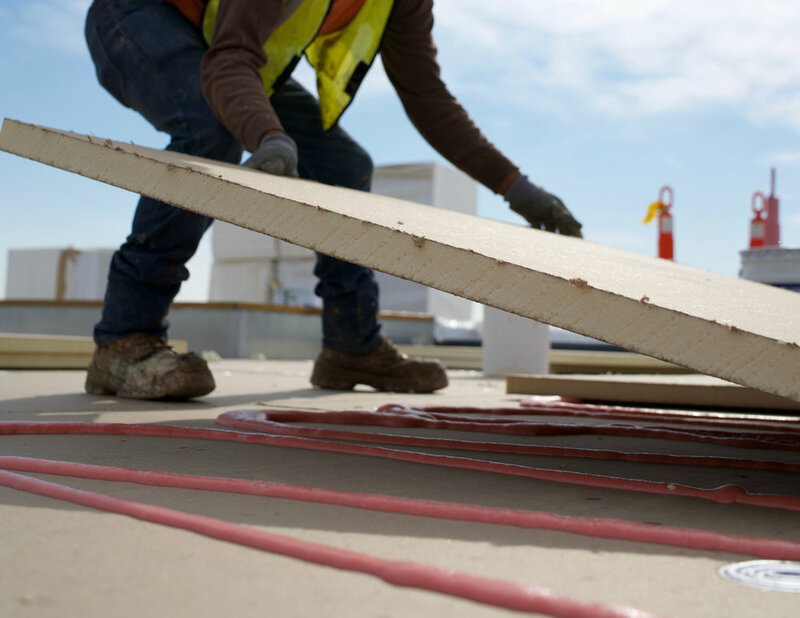 Insulation can also impact the efficiency of a building with a white or reflective roof surface that redirects heat away from the structure, such as TPO, PVC, CR G (cool roof granulated membranes) and CR (facotry-applied cool roof coating). These are believed to be most effective in regions with more cooling than heating days. And it doesn’t stop with just the membrane. Renewable energy sources, such as photovoltaic solar paneling, and water-absorbing enhancements like vegetative roofs can help reduce a building’s overall energy output from the start, while also offsetting carbon emissions that can lead to greater cost savings over time. As the push for more energy efficient products not only inside a building but also in the building’s makeup continues to gain steam, the need for selecting the right roofing solution will only become more critical. It’s imperative for roofing contractors and the designers and facility managers they work with to become educated on the climate zone needs and energy code requirements in their respective markets. See more about this topic and other series of blogs, as well as the latest in roofing news and products at https://www.jmroofing.news/industry-news.